I was fortunate enough to not only grow up in southeast Texas amid an incredible abundance of Tex-Mex restaurants, but to grow up just down the street from an incredible Mexican woman. Homemade tortillas, migas, and tamales were just a very few of the authentic Mexican dishes that Martha turned out of her kitchen. I remember helping roll out flour tortillas (because Martha didn’t use a press) and wrapping tamales (because child labor was easily rewarded with leche quemada, a Mexican confection, or Nintendo time back in the day). Martha understood the relationship between a good life and good food – the woman was always busy in the kitchen cooking for a big family event. So even though the mixture would probably be met with raised eyebrows and a few words I wouldn’t understand, I know she wouldn’t object to me violating a Tex-Mex classic with a homemade mango-barbecue sauce. Project Pastry Queen tackled this dish a few months ago when Tara selected the recipe. I originally blogged this back in November of 2007. I’ve since learned a little more about food photography – and how to bust out the crockpot for this recipe. Remove from heat and cut into 2-3 wedges. Serve with extra barbecue sauce. Didn’t even know it was still around…. Love the idea of beef and brie quesadilla – and the mango sauce! Yum! I bet the carmelization of the Dr. Pepper is yummy!! And I love the Mango BBQ sauce. These look really good. The mango barbecue sauce sounds pretty tasty. I want to crawl through my screen and eat those for lunch. I so glad you reposted this and brought it to my attention! It looks so good!!! These look delicious! What an excellent and unique dinner idea, and flavor combo too! Thanks for sharing this recipe. these look so amazing! i like how you used brie. im interested to see how that turned out! ill definitely try this recipe. thank you! those things look more like tacos than quesadillas! i lovee tex mex, i could eat it everyday! and mango barbecue sauce? that sounds..interesting, but worth a try for sure! I, unfortunately, grew up eating really bad Mexican take-out. Which is bad because it means I missed out on some truly amazing food for most of my life. But is also kind of good because it means that I have no ties to any sort of traditions. These look amazing and with the brie and mango sauce (uh…two of my most favorite things on this earth! )…I know that it would be love at first bite. Oh my god — what an awesome idea. I can practically taste it from here. YUM!! Totally making this this weekend. Not going to get Dublin Dr. Pepper in time, though… will it still taste ok if we use regular Dr. Pepper? @Luke, Absolutely, regular Dr. Pepper will be fine! Holy. Freakin. Cow. This is genius! Yum. The meat looks so juicy and tender. Thanks. For the sauce…how much garlic? The directions reference it, but not the ingredient list. Thanks! Whoops! 2 cloves of garlic. Thanks for letting me know. @foodiebride, Thanks! Don’t mean to be the comment hog here, but had to let you know that these were AWESOME! One of my faves, now. Thank you!! @Nikki (Pennies on a Platter), Glad you liked them! Hey! Someone in my Myspace group shared this website with us so I came to give it a look. I’m definitely enjoying the information. I’m book-marking and will be tweeting this to my followers! Great blog and wonderful design. tried this recipe tonight and it was amazing!!! Brisket is in the crock pot as we speak! Katie didn’t know Dr. Pepper was still around?! Honey, my blood type is DP + haha My husband is allergic to corn, so I buy dublin dr pepper since it’s made with cane sugar and found this recipe yesterday at work and I went and bought a brisket…about to put it in the crock pot now!!! What is the Dublin dp? Is it just like the pepsi made with real sugar? It’s Dr. Pepper made with real sugar. It’s bottled in Dublin, TX, so that’s where the name came from. Too bad there is no longer Dublin Dr. Pepper. Thank goodness I live in Texas. Dublin dr pepper is very special. When we make a trip to Dublin, we take orders from the neighbors. You just can’t get it anywhere but Dublin. Oh my goodness. These look heavenly. I’m making these ASAP! I can’t wait to try these and as a sidebar to what to serve with them, we have become fanatics over a new mango margarita at a Mexican restaurant near us in the Dallas area. I bet that would be great with these. And just wondering if you ever make your own tortillas? If you don’t you can reheat the store bought ones on a hot griddle and they turn out yummy. I’ll make the brisket this week for our holiday guests! As far as the quesadillas, I didn’t have brie, I used muenster cheese instead. I could not find mango chutney in either of our local grocery stores so I mixed the BBQ sauce with some sweet chili sauce which was such a good flavor combo. My picky 2 year old ate an entire quesadilla and THAT is a good sign! Yum. would love to make this but i hate dr pepper. can i use coke instead? Made these last night for my family and everyone loved! Used 2 – 3 lb. 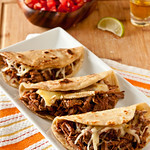 briskets, have a large family, and used one bottle, 16.9 oz, of Dr.Pepper – hardly have any leftovers. Thanks for a great recipe. I listened to Rachel Ray yesterday and she was cooking a crockpot brisket and said to get the true flavors of crockpot meat—to brown them first—then the sugars get started–(dnt know what that means) but she said the seasoning got into it better that way. An awesome recipe that I have passed around where I work and so far 3 others have made it and all have loved it. However, I would like to now have a moment of silence for what once was, Dublin Dr. Pepper. May it rest in peace*…. *For those that don’t know, Dublin Dr. Pepper agreed to stop making their DP on 1/11/12 to stop bottling their “brand” of DP and was pretty much bought out by Dr. Pepper. I was so completely bummed out to read about that yesterday! Dublin DP really is something special – it just won’t be the same coming from somewhere else. Are you sure that your crock pot is working correctly? I am just making this today, but I’ve never had a problem with roasts or even whole chickens after 8 hrs on low. I wonder if yours is malfunctioning and not getting hot enough? I’m having the same problem! My crockpot works fine. I use it all the time. I wouldn’t say it’s “raw”, but definitely not done or pulling apart. It’s been 8 hours and my family is starving! I just turned it up on high to see if another hour would help. Is it supposed to be tender? Forget it! It was done. I accidentally bought corned beef brisket and it was not tasty. 🙁 Next time! Oh no! That stinks. Give it another try – it really *is* good stuff. CAN NOT wait to make this!!! Can’t find the throwback dr. pepper can i use regular dr. pepper? This recipe sounds amazing!! Although I’m not sure what Brie is, do you mind telling me? Thanks!!! It’s a soft cheese – you’ll find it in the “fancy cheese section” – it’s rich and buttery. I typically scrape away most of the rind since I’m not a big fan of it. I’m so glad to hear that I’m not alone regarding Brie rind. I LOVE Brie, but can’t stand the rind. A little too…aged? for me. Is it okay that the brisket isn’t fully immersed under the dr pepper? There is about half inch that is above th level of dp…. Should I add water. making these on friday as a surprise for hubby- he’s going to die! any suggestions for what to serve on the side? Made this recipe today. Everything turned out perfect- the bricket was perfecty tender. Because I like some heat, I did add one large fresh jalapeno to the sauce while simmering, then proceded to blend. Wonderful dish. I will definitely make this again. These look fabulous. We are in south central Texas and love our Dr. Pepper. I shared your recipe on my Must Try Tuesday blog post this week. I made this yesterday for my man and me. OMG, the sauce was amazing, can’t wait to try it again sometime. Well heck….no more Dublin dp. Have you tried it with imposter dp? Lol. Where in south tx are you from? I’m from Aransas Pass, near Port Aransas, but live in DFW now. Yeah, we use “normal” (cough cough) Dr Pepper with no issues. We’re in Houston! I would love to see a recipe for fresh tortillas made without a tortilla press. There is nothing better than a fresh one. This recipe looks and sounds amazing, and my family would eat it. I made this (minus the brie-I don’t care for it-used mozzarella instead). It was AMAZING! Thank you! I made these for a gathering tonight and they were absolutely spectacular! Thank you for the delicious recipe. The mango bbq sauce met rave reviews… I used toasted buns rather than flour tortillas – outstanding. Will recommend this wholeheartedly! So made this for my husband and we began drinking a little early in the day, waiting to make our quesadillas later…lo and behold we got a little too tipsy and totally forgot all about the BBQ sauce! We literally just had brisket, brie, and tortilla…and it was AMAZING! 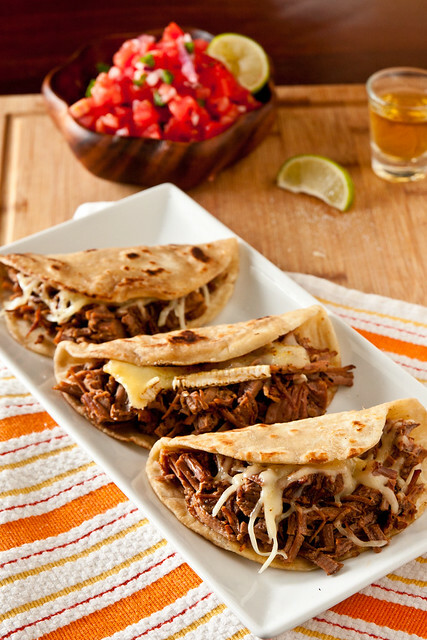 Love this recipe–never would have considered brie in a quesadilla but now that’s all I want! These look great, but I’m allergic to mango! Is there some other type of fruit chutney I could make instead? This looks amazing! But quick question- I don’t have a brisket on hand, but I have a roast, would that work as well?!? Thanks! Not sure what you are slicing in thirds…. I fixed it – thanks for the catch! I would like to know what size crockpot did you use? My crockpot is a 6qt model. This sounds great! Sorry if this question has already been asked..but is the food spicy? Since its asking for spicy brown mustard. I LOVE spicy food but the family has heartburn issues, lol! It’s not overly spicy but the barbecue sauce is acidic and the purchased mango chuntney can be spicy, depending on the brand (just something to think about). Eating one right now, DELICIOUS!!! It always drives me nuts when I find a recipe and all the comments say they can’t wait to make it, but nobody comments after to say how it was! So, I had to leave a comment to say YUM … This is awesome and this will become a regular in our house! I made your mango chutney and used the extra for the top of my quesadilla and it was fantastic. I make these all the time now. They are SOOOO GOOD! We love the bbq sauce. I also make cilantro lime coleslaw to go with them and it is a perfect match! Any substitutions for the mango chutney… Very very allergic to mango… thanks! Look on the “marinade” aisle at the grocery store for other “savory-sweet” fruit concoctions to substitute. Pineapple-habanero and Roasted raspberry chipotle come to mind. I was at the Dekalb County Farmer’s Market in Atlanta this week and found Virgil’s Dr. Better which is made using unbleached natural cane sugar. I used this in place of the Dublin Dr. Pepper which I don’t think is made anymore. It’s in the crockpot as we speak so we’ll see how it turns out! I’ve made this multiple times now and always get rave reviews. I pretty much follow the directions except I just use reg dr.pepper and instead of buying or making the mango chutney, I substitute the sweet chili sauce you can find in the asian aisle. I still use 1/4 cup along with the rest of the ingredients for the barbeque sauce and I must say, this is what makes it for me! Absolutely delish! My Aussie friends are going to love a Taste of Texas! Will let you know how it turns out! So excited! So, what do you do now that Dublin Dr. Pepper is no longer produced? Can I just use Dr. Pepper with HFCS instead (although not ideal)? Yep, just plain ‘ol Dr Pepper! I made this for dinner tonight. It was delicious. Everyone loved the sauce. I’m a native Houstonian so I may give it some extra chili powder next time. Thanks for the recipe!! What do you mean by slice against the grain? Do u do it after brisket is done cooking, and just making sure it’s tender? Yes, when you cut for building the quesadillas. It will be very obvious which way the grain of the meat runs – position your knife perpendicular to the grain and slice. So, now that Dublin Dr. Pepper is dead :'( is it better to use normal Dr Pepper or to use the Coca-Cola with real cane sugar that you can get at the Mexican super markets? Either will be fine – we usually just use regular Dr. Pepper now. I am probably one of the only people that still has some Dublin Dr. Pepper (I am from Dublin and stocked up before they quite making it). I will be sacrificing one to make this recipes, look delicious, thanks. Now that was a smart idea! How much salt and pepper do you use for the rub? It’s just me and my boyfriend at my house. 3 lbs of brisket seems like way too much for the two of us. Do you think it would still turn out as good if I cut everything in half or do you have any recommendations for making it in smaller quantities? You should have no issues with making smaller portions. I love Dr. Pepper. However, the last time I looked, there was no Dr. Pepper made with “real sugar”. Yes, I am one of the people who object to High Fructose Corn Syrup, and that is what the manufacturer uses in Dr. Pepper. This sounds ridiculously great! I live in an area with a high Latino population and a Mexican market a couple blocks away. Are there any Jarritos flavors that would work in lieu of the Dr. Pepper? Look for something cola-like or use Mexican coke. One word-delicious! My husband loved them and said they were a keeper! We will be making these again! In the instructions you say to slice the brisket against the grain, but in the picture it looks shredded. Can I just shred it? It’s actually mostly sliced – it was just fall-apart tender. You can shred it – just before you get too invested, have a few bites of the shredded brisket to make sure it isn’t too tough to eat that way. Slicing it against the grain will take care of that, though. I just made the brisket part of your recipe and let me tell you it was delicious!! Brisket is my favorite meat and I can never seem to get it right on the grill!! I was able to shred mine and it was soo tender my 9 month old was able to eat it. thank you for this wonderful recipe. Made these. One word. AMAZING! Soooooo delicious, got another brisket, making again. Thanks for sharing! What about cherry soda? I have a bottle of Boylan cane sugar cherry soda. Or should I just drink it and get a bottle of the corn syrup Dr. Pepper? Thanks! You can use just about anything… would stay away from the lighter citrusy sodas, though. I pinned this recipe on Pinterest and I can’t wait to try it! I am from a town right next to Dublin so it’s so ironic this recipe calls for Dublin Dr. Pepper! Bet you never thought you wouldn’t be able to cook it with true Dublin Dr. Pepper any more…RIP Dublin Dr. Pepper! Can you cook on high power for 4 hours and get same results? Brisket is better with the low & slow approach. I’ve been making these for awhile and my whole family LOVES them!! I’m still struggling to come up with just the right side dish to go with them, any suggestions??? I have made these several times. It’s my husbands and my absolute favorite dish! I accidentally bought “corned beef” brisket this time…. oops. I used it anyway and while I’m sure SUPER unhealthy, it was still divine! I warned everyone at the table to be drinking extra water! Hi. The first time I made this, it was perfect. The second time it came out tough??? Any advice??? Use any spicy brown mustard. Creole just happens to be my favorite. Made these! AMAZING. Kids loved then too. Tried these and they were great! If you want to save time and money, follow the recipe as directed for the brisket and tortilla’s but buy a mango or peach BBQ sauce instead of making it. The sauce it made was pretty good but you could get the same/better flavor with a bought BBQ sauce. I never heard of Dublin Dr. Pepper. Could I use just regular Dr. Pepper or what is a good substitute? Dublin DP is made with real sugar – you can absolutely use regular DP. Is their an ingredient which can be used in place of the Dr. Pepper/soda? Dr. Pepper is key for marinating pork. I’m going to have to give this recipe a try, love the flavor combinations here! http://theflavorfix.com has meat rubs and spices that might be interesting for you guys. Look forward to trying more of your recipes! I am so excited to try these tonight! I have the brisket crockpotting (that is a verb–right?!) right now and my house smells delicious! Thanks for sharing the recipe. I don’t cook or drink soda so maybe I try making this with beer? Whatcha think? Anyone else try it without something other than soda? Beef + most any meat = something awesome. Anything with brie has my name all over it. Just made brie stuffed beef burgers with and they were delish! This was awesome! Easy to make with a busy schedule and (2 boys playing sports till 10 o’clock on school nights) this worked for us. Never was a big fan of the crock pot, but it’s definitely part of our lives now and not bad when you can create dishes like this one. Thanks for having this on your site!